Hannah is making her mark! 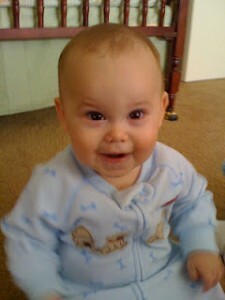 8-month-old baby Bertrand ~ Extreme cuteness may also be a symptom. Bertrand is a little boy, near and dear to my heart – so much so that his mom and I arranged he and Hannah’s marriage at our visit to the NIH. Please, if you know anyone that can help or fits this description, contact Cristina. Since the identification of Bertrand’s NGLY1 mutations, researchers are hoping to find/test previously undiagnosed children for the same condition. The presentation of kids with NGLY1 mutations may vary with severity. Both Bertrand’s mutations are located toward the end of the gene, so his he may actually be one of less affected. Over the past week, there have been a LOT of search requests coming to my blog looking for a combination of the following keywords: Hannah with the rare disease that met Selena Gomez. At least a hundred or so in the past week. Apparently there is a teenager named Hana Hwang who also has a rare disease, Progeria, that met Selena Gomez last month. The amount of exposure to the disease Progeria, the one where children age rapidly, that was raised by this one visit must be staggering. Progeria is one of those rare diseases that are actually known to a good number of people because of its unique physical appearance and the fascination of how the disease process affects the human body. It is amazing how a disease that has only about 80 known cases in the world (according to Wikipedia) has gained so much attention in documentaries, celebrity visits, etc. Maybe it has happened, but I have never heard of a story where a celebrity made an appearance with a child with Gaucher’s Disease. Can you imagine how much awareness could be brought to neuronopathic Gaucher’s disease by a single visit like this? There are a few hundred children living in the world right now with nGD, at least a few dozen here in the U.S. It really just takes one amazing, heartwarming and well-intentioned visit from a celebrity, like the one Selena Gomez made a couple of months ago to Hana Hwang, to bring about public awareness to rare diseases, especially those rare diseases that take the lives of our children so cruelly like Gaucher’s, Neimann Pick type C, Krabbes Disease, Battan’s Disease, Tay-Sachs, etc. Hopefully with the momentum that World Rare Disease Day is bringing each year (this year February 29), there will be those few celebrities who might come across a fan diagnosed with one of these fatal rare diseases and reach out to them. The amount of awareness that could be created by just those couple of hours or so could make such a difference in how the public perceives these diseases. Having recognition of these diseases like Gaucher’s by the world outside of those of us affected by them could really lead to changes in support and lead to enough funding to find a treatment! Those of us in the fatal, childhood rare disease community really have our work cut out for us. But even though I can no longer fight to save my Hannah’s life, I will never give up the fight for awareness for Gaucher’s Disease and other diseases that take the lives of our children. Ironically, Selena Gomez is Abby’s number one, all-time favorite celebrity. My Hannah may not have appreciated the visit with Selena Gomez even if it had happened, but Abby would have been in heaven being able to meet her!! 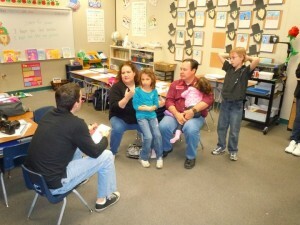 Our family being interviewed last year at Vanderburg's WRDD event. This time last year, we were preparing for Vanderburg Elementary School’s first World Rare Disease Day event. To our family, this was a HUGE gift from the principal and staff of my kids’ school. The entire school left their uniforms at home that day, and over 90% of them wore jeans to school. Jeans for Genes Day! It was absolutely incredible. Hannah was the star of the event. 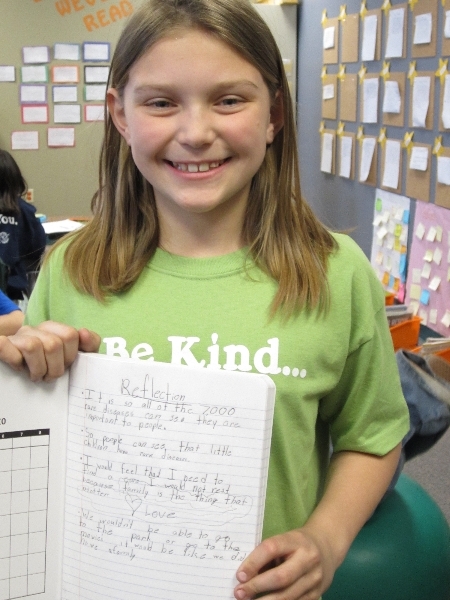 Sharing her adorable smile and just pure happiness with many of the students and staff at Vanderburg as well as a reporter from our local newspaper. She just charmed everyone that day! Fast forward to this year. It is somewhat bittersweet knowing that we will be going back for this event again, but Hannah is not going to be with us. It is a bitter pill to swallow, but this event is so incredibly important. 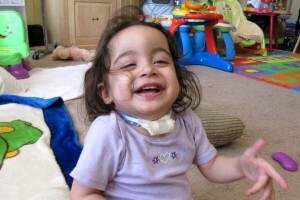 It is even more important know that Hannah is no longer here because not only do we get to share her story again, but we help educate the school kids and staff at how important it is to fight for kids like Hannah whom are affected by genetic diseases that no one has ever heard of because they are so rare. Tomorrow morning I meeting with the staff to share our plans for this event as well as hand out the hundreds of ribbon making kits donated by the Global Genes Project. Last year, I was able to bring Hannah with me to meet the teachers and staff at Vanderburg to go over the game plan for the event. They were able to meet the sweet girl they were helping us fight for. Tomorrow morning, it will just be me sharing Hannah’s story. I don’t know why I am nervous. I am not usually nervous talking in front of people, but many of these people were able to meet Hannah last year. They know that she has passed away. But now her story has changed, and it is isn’t the way we wanted it to change. My Hannah. She was the fighter. She was the one that made me want to be a fighter. I just wish she was here to give me those smiles and cuddles that made this fight so much easier.